There are many online based ETK systems like realoem and bmwfans.info for BMW parts and most work great, however none are as accurate and up to date as the ETK directly from BMW. 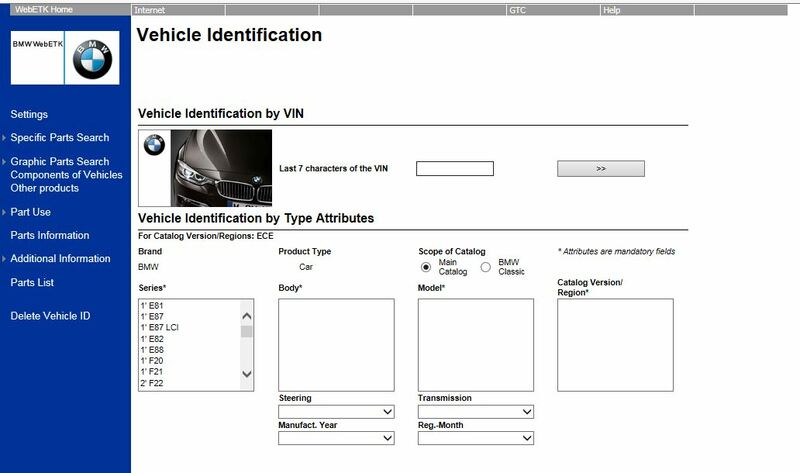 After logging in you will notice this screen where you can navigate the parts catalogue by the last 7 digits of your vin, by description or by graphics. This entry was posted on September 18, 2014 at 3:00 pm and is filed under Interesting Stuff, BMW ETK Parts Catalogue. You can follow any responses to this entry through the RSS 2.0 feed. I just tested, the login still works, give it another try. Hey I tried logging in and it said unsuccessful, May it be because I logged onto it too many times ? Still works fine. Check that your browser isn’t blocking pop-ups, as the BMW website launches the portal in a separate window. I don’t think it has to do with pop-ups, it says “user login not successful.” Not sure what the problem is, but I hope it’s not permanent. It seems to only be affecting some people (including me).